THIS ITEM IS NOT AVAILABLE AT PRESENT. 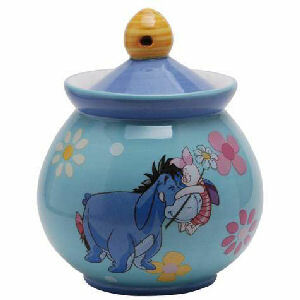 WE WILL NOT BE GETTING ANYMORE Winnie the Pooh and Friends Hug a Friend 6 Ounce Sugar Jar. From the Disney Pooh and Friends collection by Westland Giftware. Winnie the Pooh and Friends Hug a Friend 6 Ounce Sugar Jar. Made of Ceramic. Measures 4.25 Inches tall. Westland Giftware Winnie the Pooh Household Items shipping from Canada. No Surprise Border fees or Customs!